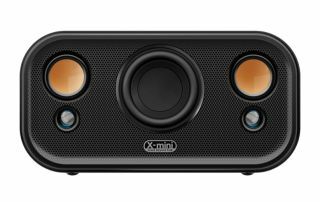 XMI to launch X-mini Clear portable wireless speaker | What Hi-Fi? Singapore-based audio manufacturer XMI has introduced its "most advanced portable speaker" in the form of the X-mini Clear, which is due to go on sale next month [November] complete with custom 2.1 system. In addition to that 2.1 system that includes 40mm Ceramic Drivers and 70mm active subwoofer, XMI's proprietary TRI-AMP design is also a feature – comprising three amplifiers designated to each of the drivers. The X-mini Clear comes with Bluetooth and NFC connectivity for streaming your music out and about. Meanwhile, a noise-cancelling microphone lets you take telephone calls or use services such as Skype. A 6600mAh Li-ion battery is included, which lets you charge your mobile device while listening to your tunes, while other features include a clear back design, three-mode Mood Lighting and a detachable magnetic grille. XMI founder Ryan Lee said: "We specially named this the X-mini CLEAR because it is to date the clearest speaker we have produced, and the clean simple design confidently reflects this. "While it is easy to produce loud volumes, we firmly believe that we should deliver quality audio through clean sound separation so that our customers can enjoy music exactly the way it was meant to be heard." The X-mini Clear will cost $199 on launch, with the UK price tag believed to be around £169.